An ambulance arrives one rainy day at City Hospital. The Pengamedics call out “Urgency Emergency! We have an injured spider.” As it turns out, Miss Muffet was the one who had called the ambulance because she found the spider at the bottom of the waterspout. Everyone knows that Miss Muffet is afraid of spiders, but that doesn’t stop her from worrying. 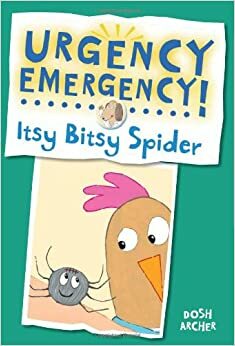 While Doctor Glenda examines the injured spider she learns that her name is Itsy Bitsy, and that she was climbing the waterspout when the rain washed her out. After the cut on Isty Bitsy’s head is stitched up, she is a bit wobbly and needs someone to help her home and take care of her. Once again Miss Muffet comes to her rescue! How fun this beginning reader is! Dosh Archer is very successful at combining the nursery rhymes of Itsy Bitsy Spider and Little Miss Muffet . I recommend a refresher on both those rhymes before reading this story to thoroughly enjoy the characters. The reader doesn’t have to stop with this book as there are more books in the Urgency Emergency series. Nothing says “Summer” like a good old fashioned family road trip! Now take that family road trip, throw in a reformed juvenile delinquent, a feisty waitress, an ornery auto mechanic, and an introspective border collie, put them on a big yellow school bus, and send them off to rescue a puppy. What do you get? 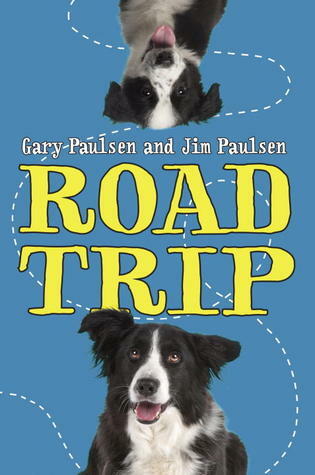 You get Road Trip, a fun summer read by Gary Paulsen and Jim Paulsen! Road Trip is the first collaborative effort by prolific author Gary Paulsen and his sculptor son Jim. Similar to a game of Exquisite Corpse, the father-son duo took turns writing chapters and sending them back and forth to one another. As they did, the story and characters grew in ways neither could have expected. Despite what might sound like a disjointed writing method, the Paulsens manage to maintain a cohesive feel to this short novel. Quirky characters abound throughout this madcap story of a father and son struggling to understand one another. Road Trip is a perfect quick read for vacationing 5th graders and up. Perhaps it will even inspire an impromptu road trip or two along the way. Maria (a girl) and Mouse Mouse (a mouse) live in the same house. Maria and Mouse Mouse are playmates, but they must keep their friendship a secret from their families. Maria’s family would not be pleased to discover there were mice living in the house, and Mouse Mouse’s family would be frightened if they knew they had been discovered. One day, as the two friends are each preparing for bed in their respective parts of the house, each calls for their mother, and each discovers that their mother is missing! Simultaneously, Maria and Mouse Mouse search throughout their house, eventually running into each other and a very surprising resolution to the mystery! This simple story is brought to life with detailed illustrations by Barbara McClintock. In each spread, we see both households side by side, so readers can compare and contrast details of each home. The mouse house has a “borrower” element – an upright flashlight serves as a floor lamp, a seed packet is wall art, and a thimble is a teacup. This is a cozy, sweet story with illustrations that kids and parents will pore over for their charming detail. The story ends with a question that will prompt children to tell their own stories. Where’s Mommy? is the sequel to Mary and the Mouse, the Mouse and Mary. 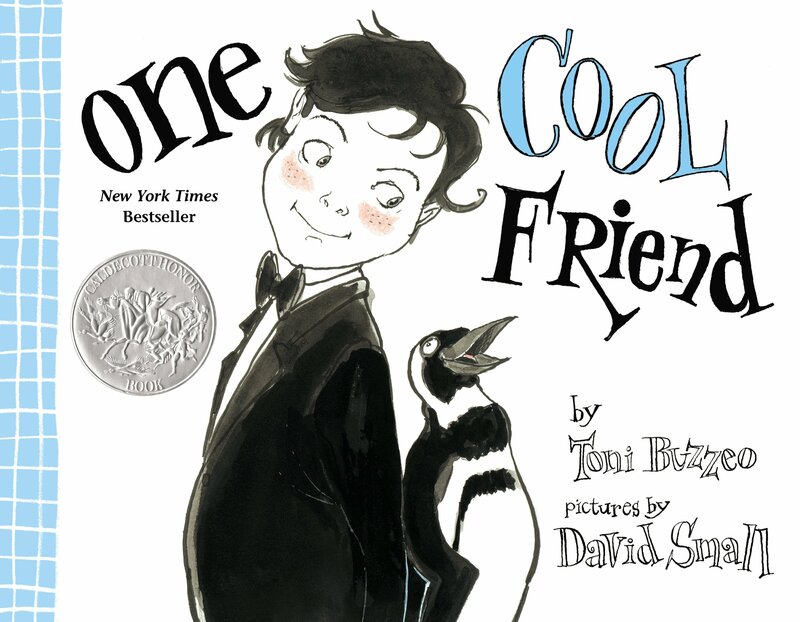 This oldie but goodie is one of my favorites, and it is the perfect read for our summer reading club. A child is looking for a pet and writes to the zoo to get one. The zoo has quite a hard time finding the correct pet and sends an elephant, a giraffe, a lion, a snake, and a monkey. Of course, none of the animals are just right and must be sent back. The zoo finally finds the perfect pet and sends a dog. Little ones will have fun discovering what is under each flap and making animal sounds along the way. Summer Reading is here and we are excited for our “Paws to Read” program! In light of our animal-themed Summer Reading Club, I could not resist reviewing this sweet book about two dogs finding their way in their world. This gentle read will appeal to most dog lovers. 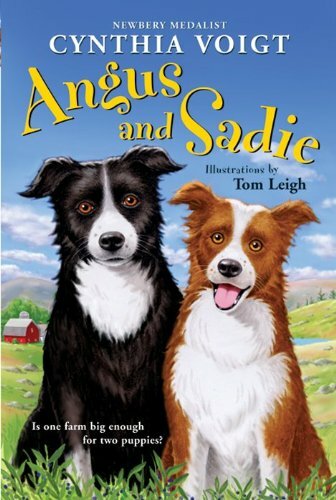 Angus and Sadie are two Border collie littermates that are acquired to become farm dogs. The story told with dialogue between the two dogs as well as some from their owners, Missus and Mister. The dogs have very simple interactions when they are puppies and their interactions become increasingly complex as the book goes on. Readers will enjoy hearing the dogs’ point of view and Mister tries to train them to come, stay, and herd the sheep on the farm. The most endearing part of the book is the development of Angus and Sadie’s distinct personalities. As with any siblings, they develop into very different individuals. Angus’s boundless energy and happy-go-lucky attitude contrast with Sadie’s sweet, quieter disposition throughout the story. While housed in our older fiction section, this story would be a delightful and completely appropriate read for younger children reading slightly above grade level. If you like this book, do not miss Voigt’s Young Fredle, a companion novel which takes place on the same farm and features a young mouse’s journey to get back to his family after getting ill and being separated from them. Mr. Tiger is completely and utterly bored. He lives in the city where his animal friends are proper all the time. 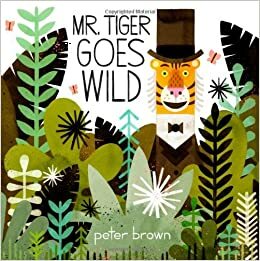 But Mr. Tiger doesn’t want to be proper, he wants to be wild! Mr. Tiger starts to act differently and his friends think his behavior is unacceptable. He runs to the wilderness where he can finally be himself. The only problem is that he misses his friends and his home. When Mr. Tiger returns to the city he is happy to find that things have changed quite a bit.